Working at home has many advantages. This also includes the opportunity to set up the study to your own taste. In order to be able to work in a concentrated manner, the facility has to meet a few requirements. In particular, ensure sufficient lighting, inspiring colors and plenty of storage space. When it comes to working on the PC, there are some important rules to consider when lighting. And rest is important not only for the ear, but also the eyes. To bright colors distract as well as disorder or a small-scale design. The most ideal illumination of the study is for a healthy and effective work of particular importance. Too light or too dark environment leads to fatigue of the eyes. Concentration and efficiency decrease within a short time. The activity on the screen is already straining for the eyes anyway. So help yourself with the right lighting if possible. When it comes to the best lighting, daylight clearly comes first. Compared to artificial illumination, natural light has a decisive advantage. With its special light values ​​it keeps the human body awake. At the same time, it has a positive effect on the mood. It is therefore advisable to place the desk near the window. It is less pleasant, however, if you are blinded by the sun at work. It is important to avoid this. Therefore, make sure not to sit with your back or head to the window. Reflections can be most effectively avoided by placing them laterally at a 90 degree angle. Glare protection can be used to individually regulate the incidence of light. Foil roller blinds, such as the one from aquasun.de, can be adjusted as desired, so that you are largely free when positioning the desk. The advantage here is that the view to the outside through the slides is not affected. In addition, the roller blinds block almost 100 percent of the harmful UV rays. Natural light is not always available. Therefore, an artificial illumination of the workplace is unavoidable. Ideally, the lighting design was already considered during construction or modernization. If there is a renovation you should consult with an expert for the right lighting. This ensures that the required sockets and connections are in the right place. If improvements are required in this area, it is usually much more expensive. The backlight should consist of evenly distributed light. Suitable for this are, among others, ceiling lights or ceiling spotlights. This is a relatively low-contrast light, which fatigues the eyes over time. Therefore, if possible, set additional light accents. 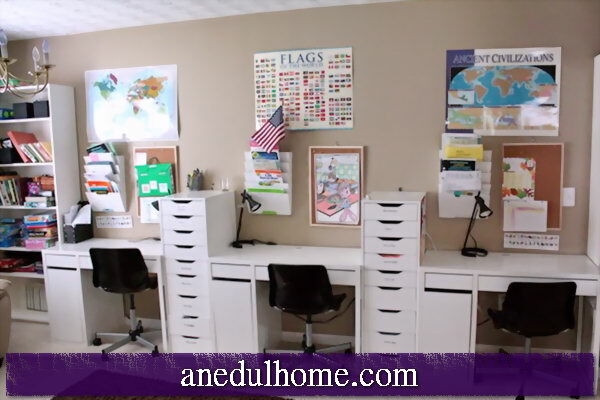 These provide variety in the home office, which is particularly beneficial for the eyes. With the right dosage, the beautiful elements in the study can be highlighted. It is advisable not to put too much emphasis on the ceiling lighting. For example, aim some spotlights at the bookshelf. Most of the time you will probably spend at your desk. As far as the lighting is concerned, the desk lamp therefore has a special significance. Pendant and floor lamps are very well suited for precise illumination. These can be adjusted easily and flexibly. Desk lamps, which can not be individually aligned with the screen, are not recommended. In various test reports, so-called daylight lamps also provided good results. These are equipped with special bulbs and thus come to similarly high lux values ​​as natural daylight. Avoid light reflections on the screen by illuminating the desk from the side. For left-handers it is advisable to place the lamp on the right side. This avoids making your own hand an annoying shadow. Fortunately, those who work at home can set their office up to their own taste. This is especially pleasing when it comes to the color scheme with your favorite personal colors. However, colors are not just a beautiful look of importance. They also have an overarching perceptual psychological effect. These colors can be used to bring the desired atmosphere into the study. Blue, green and violet tones, for example, have a more calming and harmonizing effect. In contrast, red, yellow and orange tones have a stimulating and activating effect. Caution is advised in very intense colors. As a result, so-called afterimages are generated in the eye. A similar effect arises even when you look directly into the sun. For example, if you look at a completely red pattern for a certain amount of time, then you perceive the same pattern in the color green for a certain amount of time. Of course this is particularly disturbing in the study. Dark colors should also be used sparingly. A darkened room can be very narrow. For larger areas, we recommend the use of light and soft shades. Wherever work is required there should of course also be sufficient space for the work equipment. An office that looks untidy distracts strongly from the daily work. There are now a variety of flexible storage solutions that create a lot of space in small rooms. Also make sure that your work equipment is easily accessible. Cumbersome searching for files and papers is not only annoying, it also costs a lot of time. If the workspaces still serve a representative purpose, optics are even more important. A tidy study with a pleasant atmosphere is essential for effective work. With the right light, a pleasant color and sufficient storage space, this can be achieved relatively easily. In any case, take enough time to plan the study. This always pays off later. You can then start much more concentrated work and therefore earlier in the well-deserved closing time.